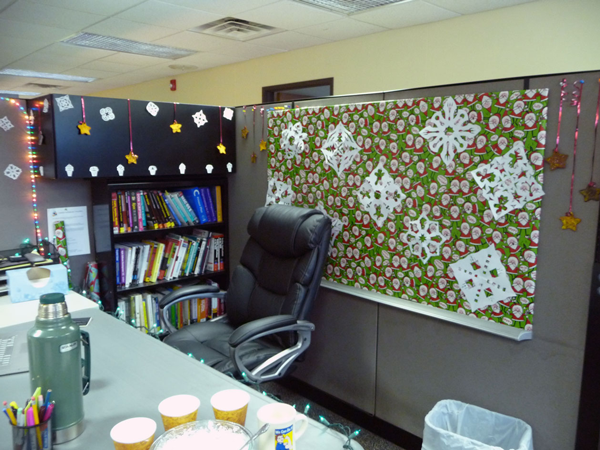 Last week our company essentially took recess on Friday morning in honor of the 1st Annual Christmas Decorating Contest. UX became it’s own department separate from (but embedded in) the Tech team this past summer, so the friendly rivalry was running strong between us leading up to this. After some discussion over what we might choose to do for our area, we chose to focus on fun and food. 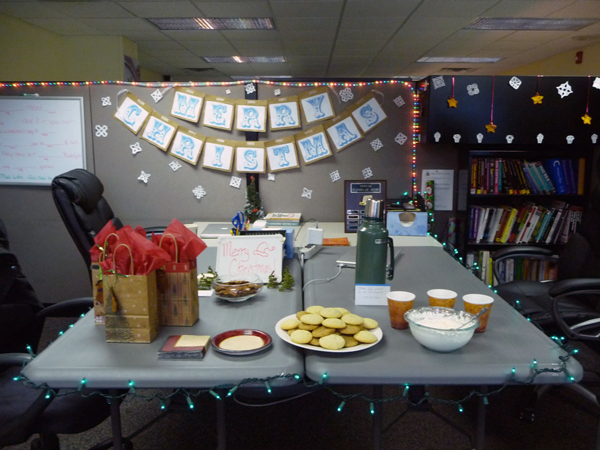 Part of this was obvious – cookies, Mexican hot cocoa, gift bags with more cookies and some wonderfully tasty homemade whipped cream. 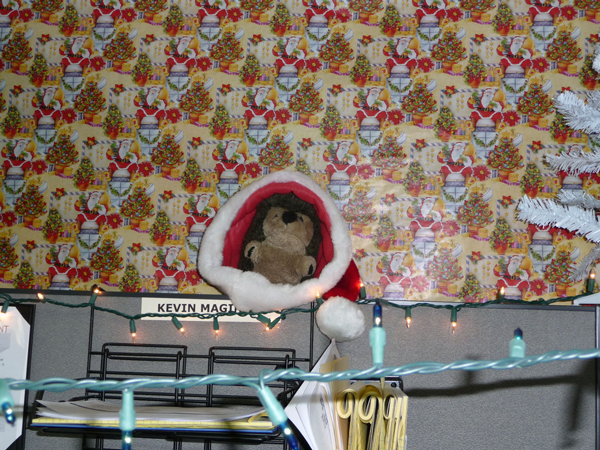 But this is a decorating contest, right? How do you incorporate food into holiday decor? 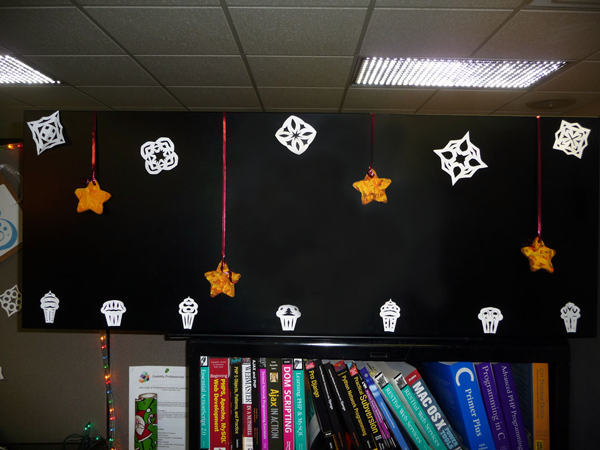 Food themed snowflakes and cinnamon ornaments, of course. The ornaments did cause a bit of confusion. 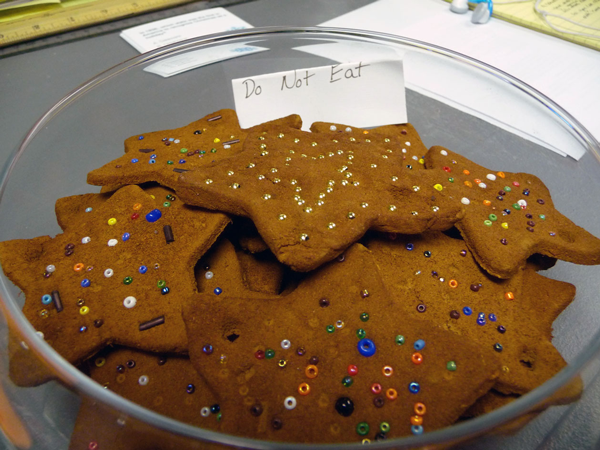 You might think the beads would be enough to get that they weren’t cookies, but we decided to take the safe side of things. 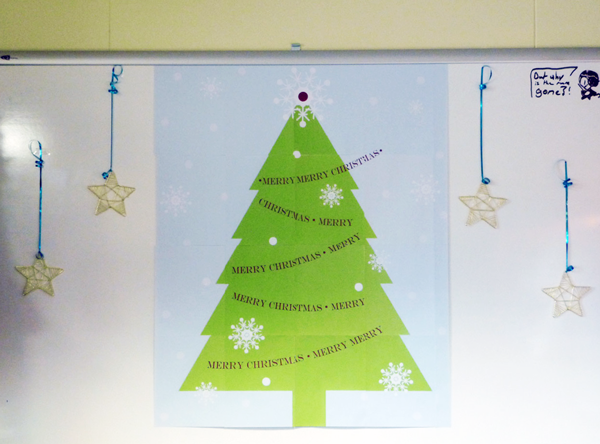 Caitlin made up a Christmas tree design for us while I turned a hand at snowflake cutting. 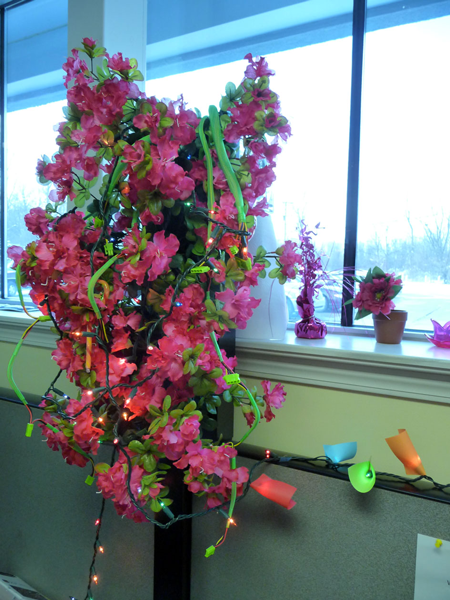 Our tree was a bit different than the ones found just across the cubicle in the Tech department. 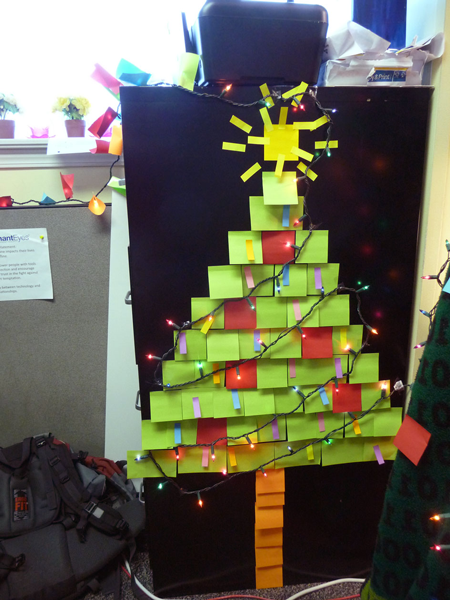 One of their was made of post-it notes (they chose a theme of office supplies). 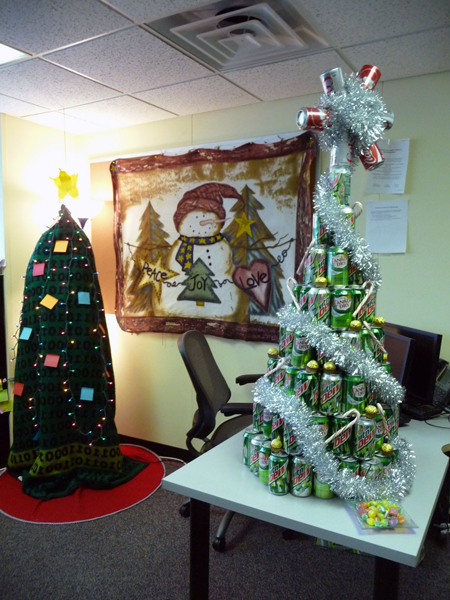 Their crowning glory, though ,was the Mountain Dew/ginger ale tree. It was pretty amusing and very definitely a reflection of them. 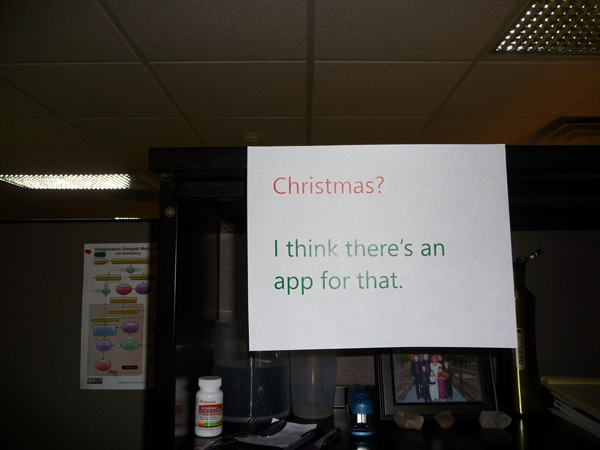 We in UX could not just leave it at food and decor, though. 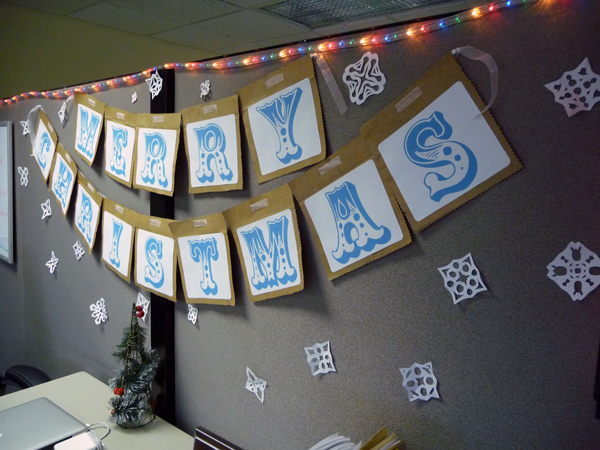 We’re interactive people – the User Experience department. 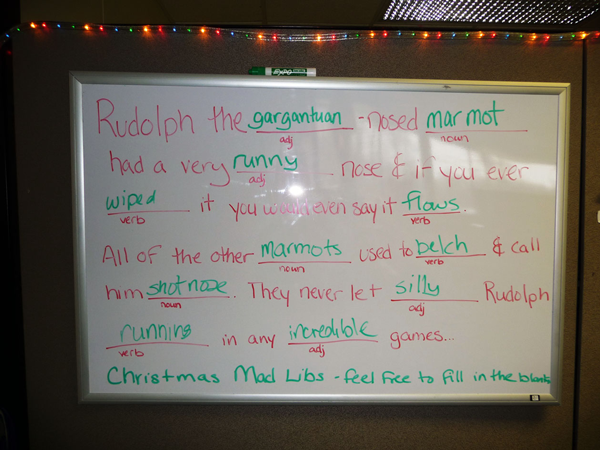 So Caitlin took it a step further with some Christmas trivia for the judges followed by a bit of Christmas Mad Libs. A marmot, for those who may be unfamiliar, is a large rodent like a groundhog or squirrel. We have one for a mascot – Ce Marmot. New Business kidnapped him for the judging. 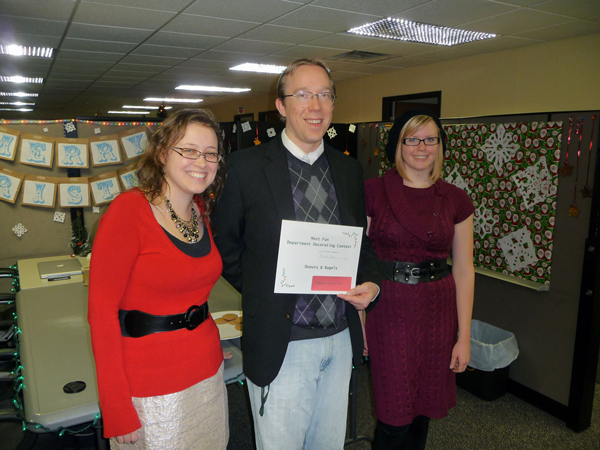 We closed out our time with the judges with an impromptu rendition of ‘Rudolph the Gargantuan-Nosed Reindeer’ at the request of our president. So, how did we fare? 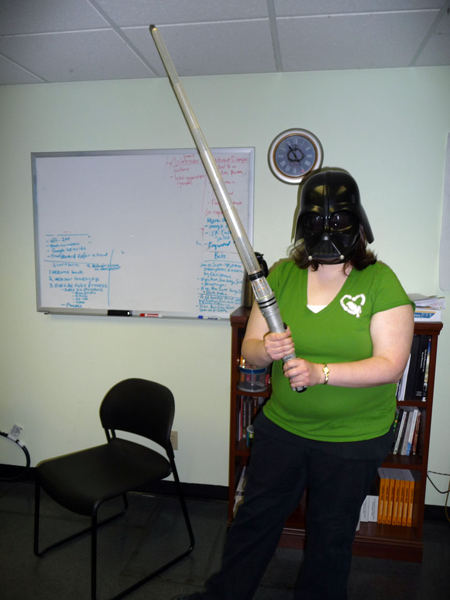 We didn’t win the overall prize – that went to the Jedis over Customer Service (they did a lovely job) BUT we won ‘Most Fun’. The devs? They got ‘Most Original’, which worked out well for all. Here are a couple of other photos from their area. 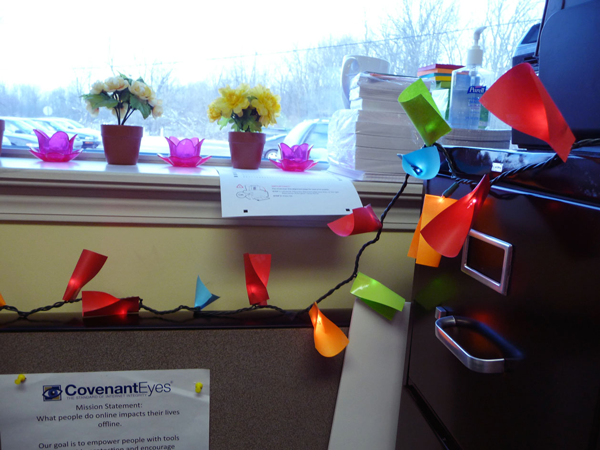 To my personal amusement, they also retained and decorated our gift to them back when we helped decorate their work area. 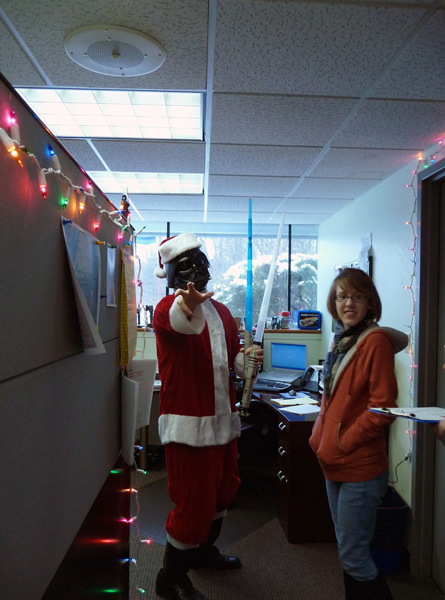 The fun wasn’t limited to our side of the building, though. 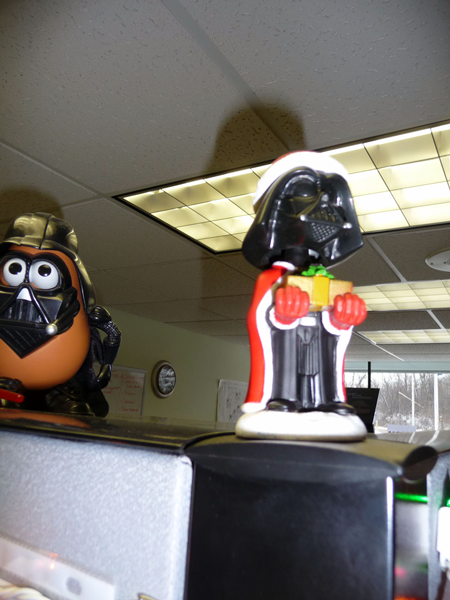 I personally enjoyed the Star Wars theme over at Marketing (which is otherwise known as the Dark Side). 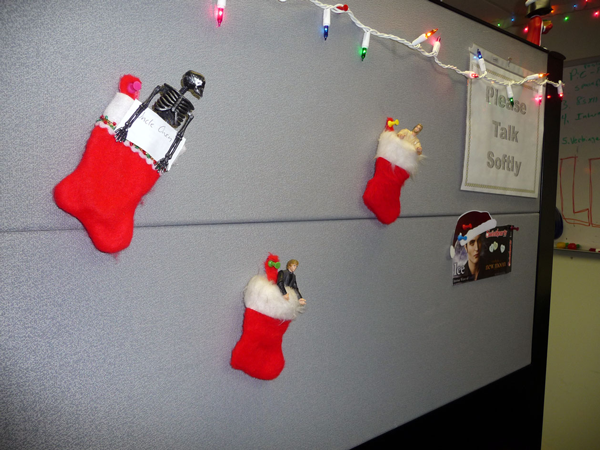 I’ve been admiring their stockings for several weeks. If you can’t read it – the skeleton is Uncle Owen. Lord Santa even made an appearance. 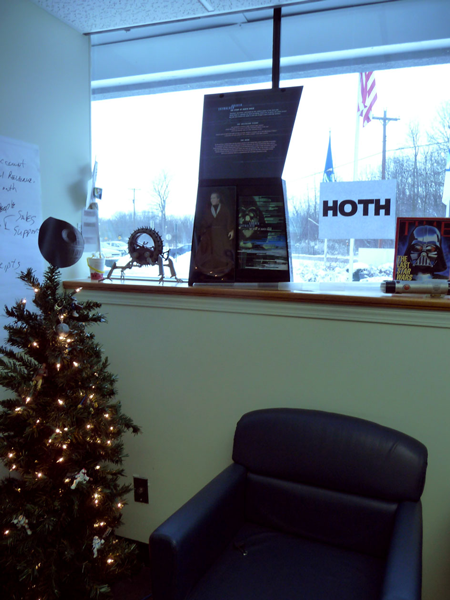 There was also a smaller Vader feeling the Christmas spirit along with a slightly different star atop their tree. Curiously, this morning it was pointed out to me that Rudolph was no longer a gargantuan-nosed marmot, but instead a… well, I’ll just write it out in it’s entirety. “Rudolph the bloody-nosed Vampire Spork had a very evil nose and if you ever stubbed it, you would even say it invigorates. The vampire spork was a dead giveaway of the culprit. If it hadn’t been then the addition of the penguin would have been more than enough. @Firstcrusader didn’t even try to deny it when I mention it to her. I may just start calling her FirstcruVader after this pic, though. 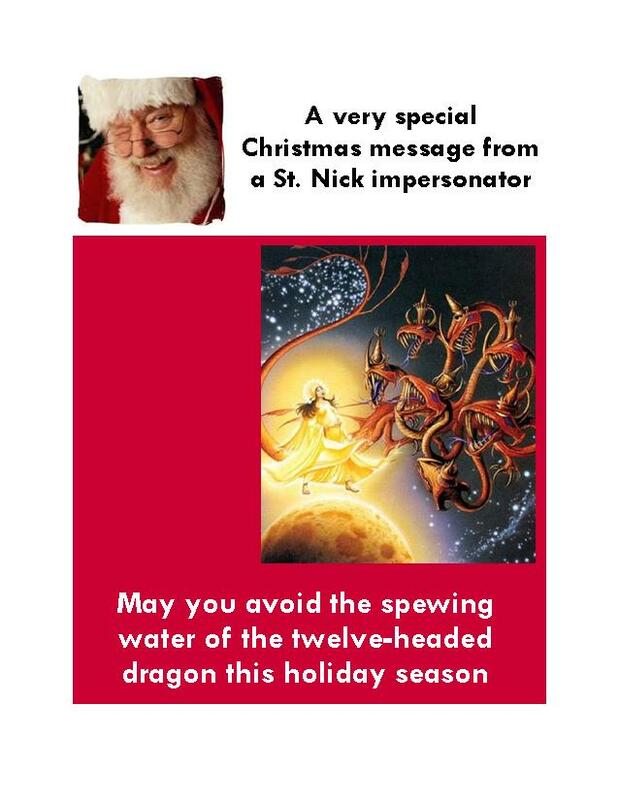 PS Our blogger also sent an excellent holiday greeting out to us this week. I hope you enjoy it.